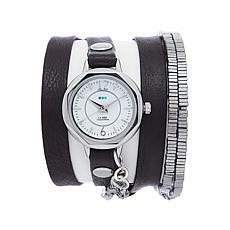 La Mer Silvertone Octagonal Case Black Leather and Square Bead Wrap Watch It's as plain as black and white. This watch is fabulous. From the octagonal case to the leather wrap and square-bead chain, this timepiece is trendy and signature worthy. Slip it on and know that you are done accessorizing.